How Serious Is The City’s TOP LEADERSHIP About Cycling Safety? 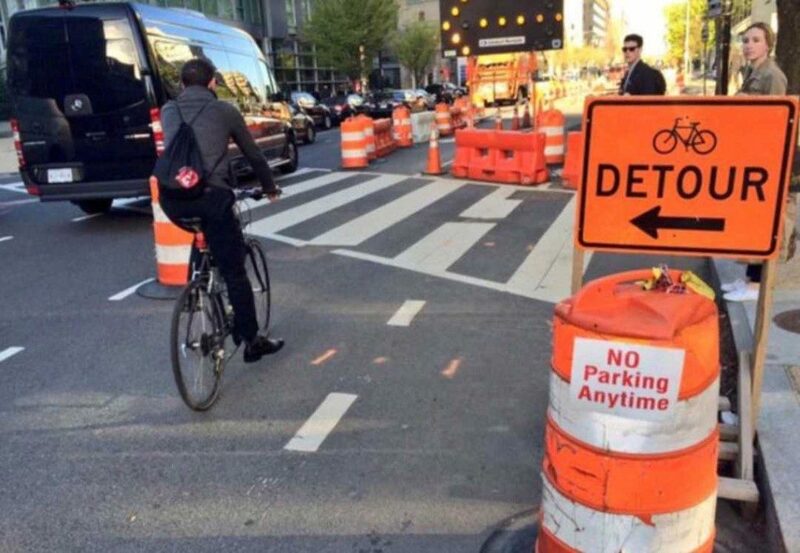 Do you find yourself cycling and then suddenly your bike lane or pathway just disappears into a major construction zone and you are forced into traffic? We are experiencing record road construction this season, yet almost a year and a half later a report to develop GUIDELINES for construction contractors to accommodate cyclists is still being delayed! I have to ask just how serious the Mayor and the Chair of Public Works are about pedestrian and cyclist safety. Seriously, if we are able to prepare and deliver on record road construction, for the fourth year in a row – surely we can at the very minimum – BORROW guidelines from another city and implement to ensure cyclists safety in a record road construction season. Your City Council is governed under the ‘Strong Mayoral Model’ meaning, the Mayor wields a lot of power and can navigate quite quickly through red tape and bureaucracy – if they want to. I as a Councillor – can bring motions forward, and advocate for change. Almost a year and a half later – I am still advocating. I ENCOURAGE YOU to send an email to the Mayor: bbowman@Winnipeg.ca and advocate to make cycling safer during this record construction season. OVER A YEAR AGO – on April 3, 2017, I requested guidelines be developed – for construction contractors to accommodate cyclists – see motion below. AND WHEREAS the City of Winnipeg mandates contractors to adhere to the City of Winnipeg’s Temporary Traffic Control Plan Manual guidelines, to develop and to implement a Traffic Control Plan with each construction project, but has extremely limited resources to enforce independent plans, thereby potentially jeopardizing road safety for all road users and workers. Updating the City of Winnipeg’s Temporary Traffic Control Plan Manual to include guidelines to accommodate cyclists during roadway construction activities, and as recommended in the Pedestrian and Cycling Strategies. Investigating working with the Winnipeg Police Service and the Winnipeg Parking Authority to provide increased enforcement support of Temporary Traffic Control plans during the construction seasons. If increased enforcement support is unachievable during construction season through the Winnipeg Police Service and the Winnipeg Parking Authority, that the matter be referred to the Winnipeg Public Service to increase enforcement staffing for consideration in the 2018 Capital Budget process. Then – 365 days later – the Public Works Committee AGAIN EXTENDED the report for another 90 days!